Currently Inteset Remote Management Services are entirely free. They will continue to be free as we develop the service and add more features. There are several features that will always be free such as remotely updating Secure Lockdown to the latest release, taking a snapshot of the current activity on the device, and viewing system information and full status of the device. We highly recommend registering Secure Lockdown with the RMS whether or not you'll be using the paid services in the future. Download and install the latest release of Secure Lockdown. 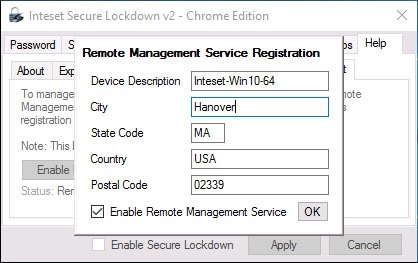 Go to the Secure Lockdown Utility > Help > Remote Management screen, then press the "Enable Remote Management Services" button. Enter the requested information and enable the "Enable Remote Management Services" checkbox. Now that the software is registered, from your browser, you can sign into your Inteset Account and go to "My account > Manage Devices" where you'll see your newly added Secure Lockdown device.